This is Lady Morthanlu. I got her from a Menagerist Goblin during Season 11. The Menagerist Goblins are the only type of goblin that drop pets. 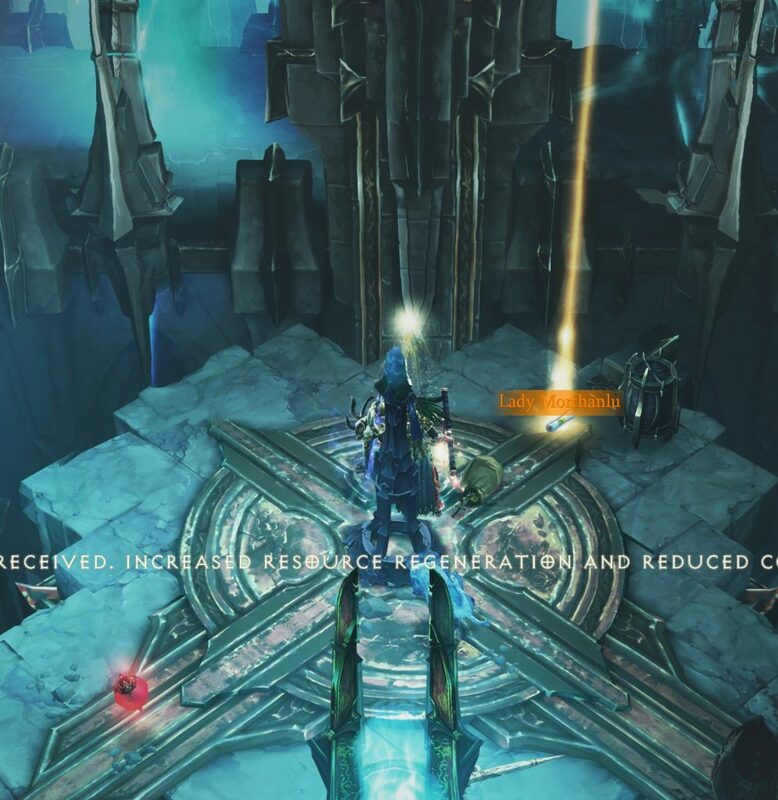 Kill the Menagerist Goblin – and it will drop a random pet for you. The flavor text for this pet says: “Lady Morthanlu is the picture of sophistication and charm. Only the most refined adventurer will bring her along!” – Barker Chan. 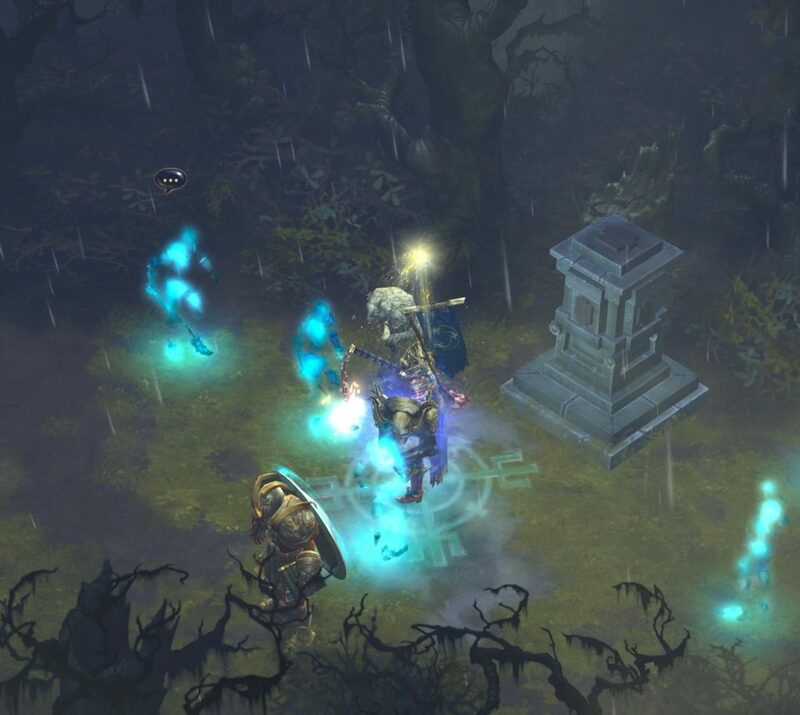 When a Menagerist Goblin drops a pet – the item will look like a Legendary scroll. The item will say the name of the pet. The Lady Morthanlu item will automatically go into a player’s bag when they pick it up. Players need to right click on the item after it is inside the bag. Doing so will put the pet into the Wardrobe (with all the other pets the player has collected). 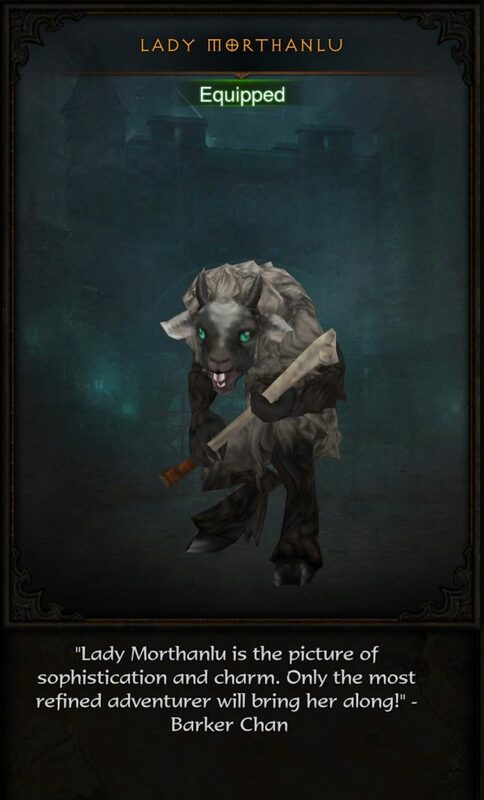 The flavor text on the Lady Morthanlu item says: Is this a tiny goatman? Or…? There doesn’t seem to be any information about who Barker Chan was. A barker is someone who stands outside of a carnival sideshow and calls out to passersby in an effort to interest them in paying to go into the sideshow and see what is inside. He probably yelled: “Lady Morthanlu is the picture of sophistication and charm. Only the most refined adventurer will bring her along!” to describe Lady Morthanlu. It’s possible that Lady Morthanlu was part of a freak show or curiosity show of some kind. There’s no way to know whether she was brought there by force, or if she decided it was a good way to make some money and joined willingly. 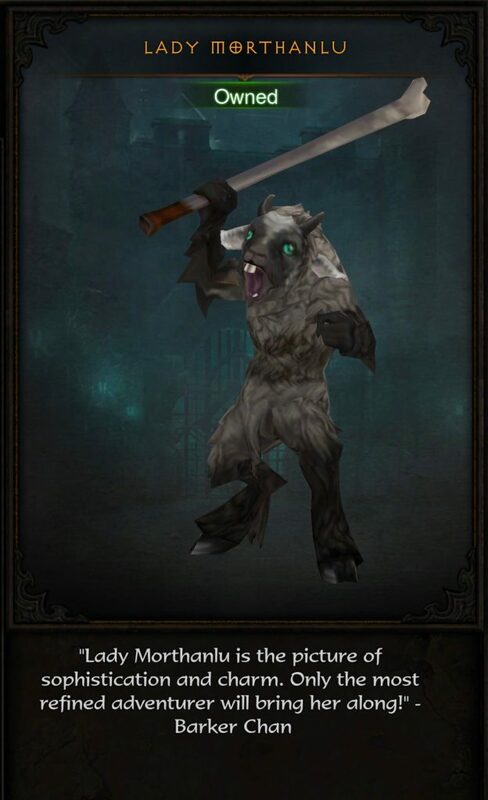 The Diablo Wiki says that “goatman” is a colloquial name. They were originally called Khazra. 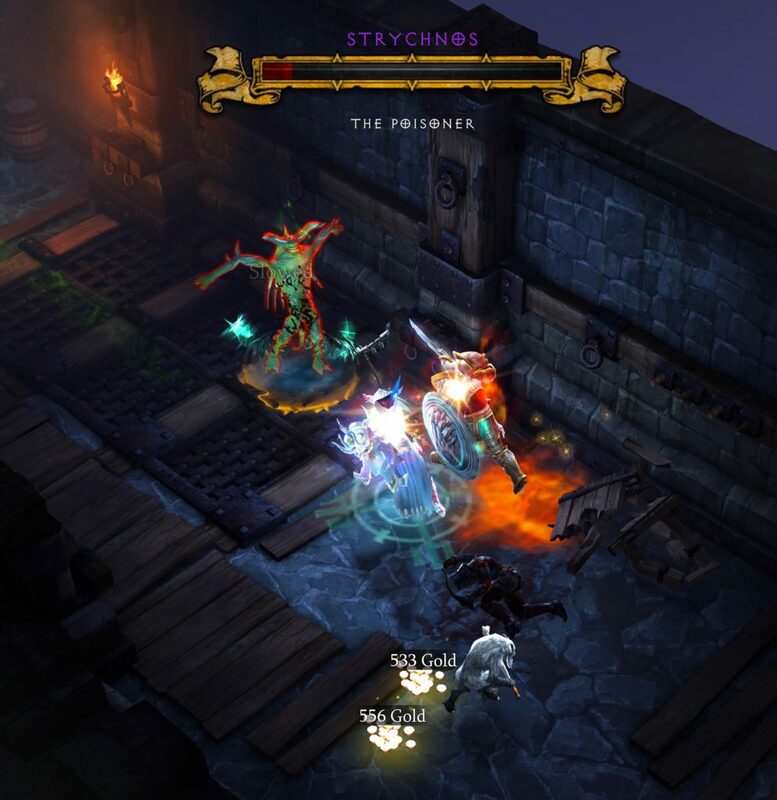 (Players fight them in Act II of Diablo III.). The Khazra started out as the five clans of the umbaru race from the Torajan jungles of the Teganze. The lore behind the Khazra is a bit fuzzy. Some lore indicates that Khazra started out as human, and then got corrupted by the Vizjeri mage clan. Other lore says that the Khazra are lieutenants of Baal (one of the Prime Evils). There are a few Khazra that officially have names. It’s hard to say if Lady Morthanlu is really her name, or if that was the name given to her after she ended up in the freak show. I’m going to guess that a Menagerist Goblin snuck into the freak show one night and stole Lady Morthanlu away. 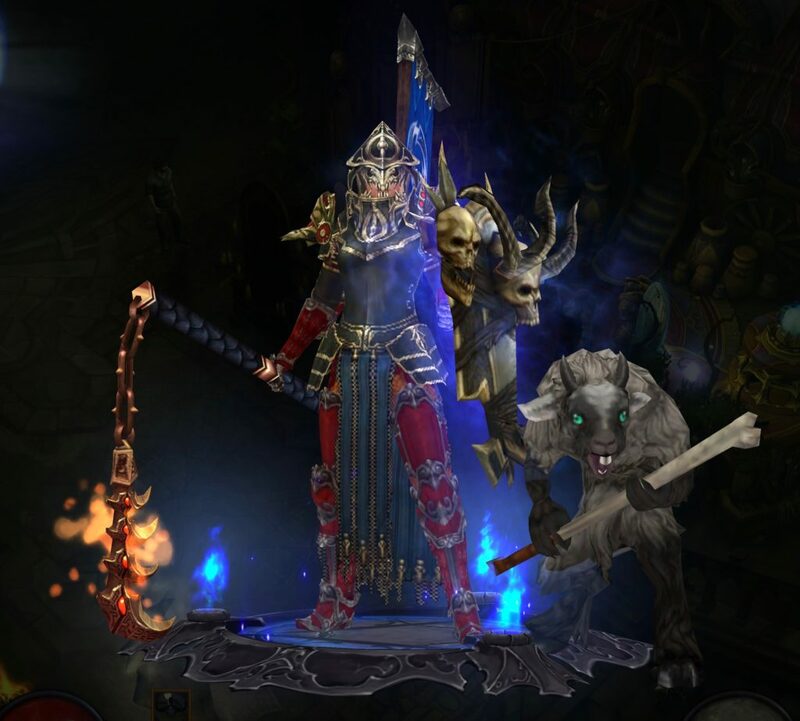 If you look closely, you can see Lady Morthanlu standing next to my Crusader. 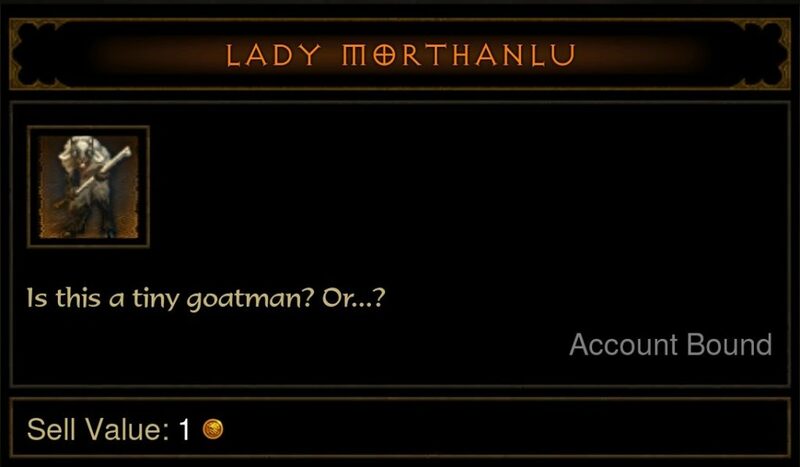 Lady Morthanlu, like other pets, will pick up gold for the player. Lady Morthanlu is a large pet. She’s easy to spot in-game (unless you are fighting a mob of Khazra). Lady Morthanlu carries her own weapon, and appears to want to use it. She won’t actually attack enemies, though. I like to think she uses her weapon to push enemies out of the way she she can pick up the gold that has dropped on the ground. Lady Morthanlu is a post written by Jen Thorpe on Book of Jen and is not allowed to be copied to other sites.